(CNN) -- Michele Scarponi claimed his second stage victory of the Giro D'Italia after winning a sprint finish to the 18th leg on Thursday. 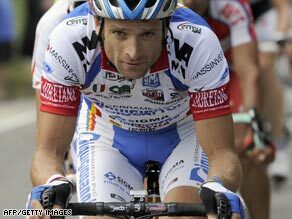 Italy's Michele Scarponi won his second stage of the 92nd Giro D'Italia on Thursday. The Italian cyclist edged past Felix Rafael Cardenas of Colombia and Danny Pate of the United States, with all of them recording the same time of four hours, seven minutes and 41 seconds over the 113 miles (182 kilometers) from Sulmona to Benevento. Russian rider Denis Menchov retained his 26-second overall lead after finish back in the main pack ahead of Friday's testing climb up Mount Vesuvius. His nearest challenger is still the 2007 winner Danilo Di Luca, while another Italian -- Franco Pellizotti -- is third, two minutes off the leading pace with just three days left in the race. American legend Lance Armstrong remained 12th overall, more than 12 minutes behind Menchov. Scarponi, of the Diquigiovanni team, followed up his victory on the sixth stage after a stage featuring mass breakaways and rain storm that saw Philip Deignan (Cervelo), Andriy Zeits (Astana) and Francesco Gavazzi (Lampre) among the casualties of the leading group. Scarponi was part of a 25-strong group that broke clear at the midway stage, and he held on as that pack splintered near the end to win the four-man sprint to the line.